Ever wondered what $1 billion looks like? Wonder no more. Moldovan artist Stefan Esanu has used towers of cash to illustrate Moldova's 2014 banking scandal. 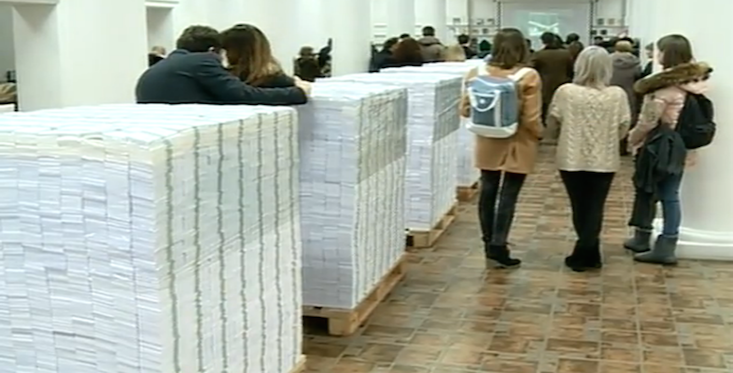 Esanu's ten huge blocks of fake $100 bills, each weighing in at 500 kg, are a visual representation of the $1 billion that disappeared from three Moldovan banks in 2014. The fraud scheme saw money transferred to shell companies in the UK and Hong Kong, with the total loss from the scheme equivalent to 12% of Moldova's GDP, and was followed by months of anti-government protests. “People have no idea what a billion means. It is like saying ‘cosmos’ but people cannot imagine what this really means,” Esanu told the Report news site. The 1.4 metre-tall piles of money are being exhibited at the B.P. Hasdeu Library in Chișinău, along with interviews with 33 local people sharing their perspectives on the scandal.